Yesterday, I was doing a bit of research on movies featuring Leprechauns. I chose to ignore the modern series of Leprechaun movies because I was looking for nice, family-frendly movies. I found seven movies that sound interesting and created a page about them called Looking For A Family Friendly Leprechaun Movie For St. Patrick's Day. I also created a page about The Magical Legend of the Leprechauns which gives a more indepth discussion of that particular leprechaun movie. All of the Amazon customer reviews are positive, with comments like "It will make you laugh, how this Leprachaun brings bad luck, not good to a girl who has just moved to a small town," "My girls (ages 9 and 6) watched this movie for the first time and fell in love with it," and "It has just every thing I could wish for in a film like this; I do so LOVE this film!" The combination of three items ~~ the positive comments, the humor and the intriguing cover art ~~ means that I am definitely adding this one to my watch list. How about you? 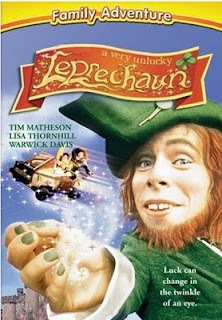 Do you have a favorite leprechaun film? Buy A Very Unlucky Leprechaun from Amazon.